SATURDAY April 20, 2019 we leave from coffee call- 9am. We plan to leave Norman from and drive to NOCONA, Texas on US 81 out of Oklahoma (we will take a short break twice on the way down, it is about 2-1/2 hours down there (130 miles) and then US 82 east in Texas to Nocona where we will find the highly rated Horton car museum. We will tour the museum and their 138 plus vintage cars and then to lunch in town. ( Note: the restaurant does not accept credit or debit cards) Following lunch, you are free to head back to the museum, or return to Norman at your own pace. Admission to the museum is free to Veterans and active duty military with proper I.D. otherwise it is $10. 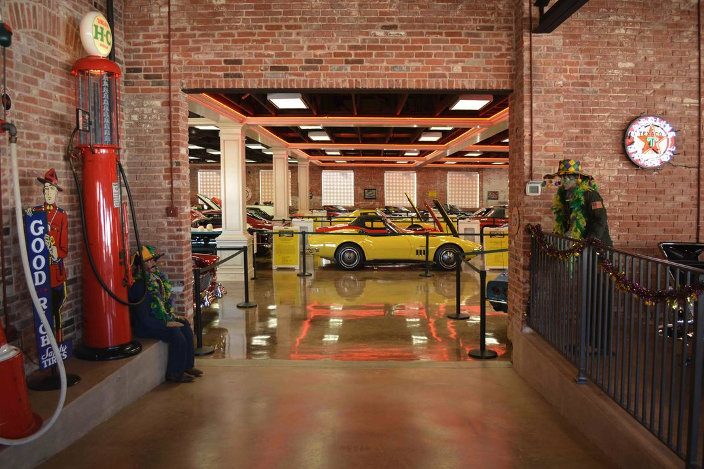 The Horton Classic Car Museum is housed in what once was the town's Ford dealership. Over 138 cars are contained in the collection in 37,400 square feet of space. 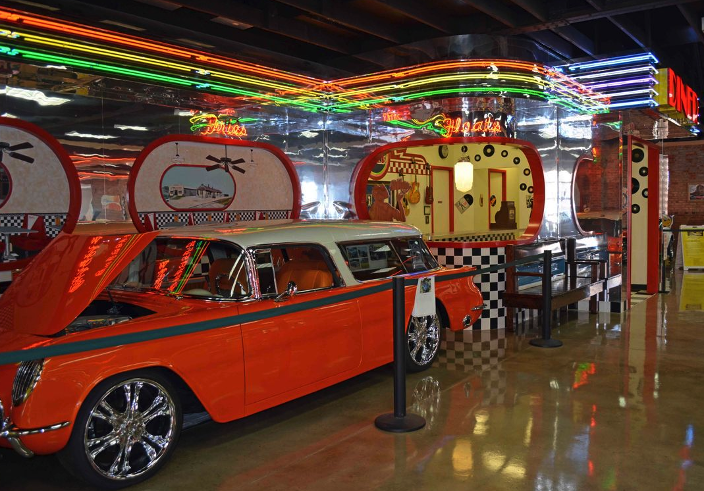 The Museum largely focuses on American vintage, classic and muscle cars. Over 40 Corvettes are part of the collection, featuring nearly every year of production between 1953 and 1978. Several 1950's era convertibles are also included, along with many 1950s Senior Award winners from the Chevy and Pontiac Nationals. Different models of Chevrolets, Fords, Pontiacs, Packards, Plymouths, Oldsmobiles and even a Studebaker are featured in the collection, which is always changing and growing. To put it into perspective, the total horsepower of all the cars at the Horton Classic Car Museum is 46,347 hp - that equates to over 46 megawatts, enough to power over twenty-three thousand homes! Imagine the gas mileage if all those cars were running at peak power. 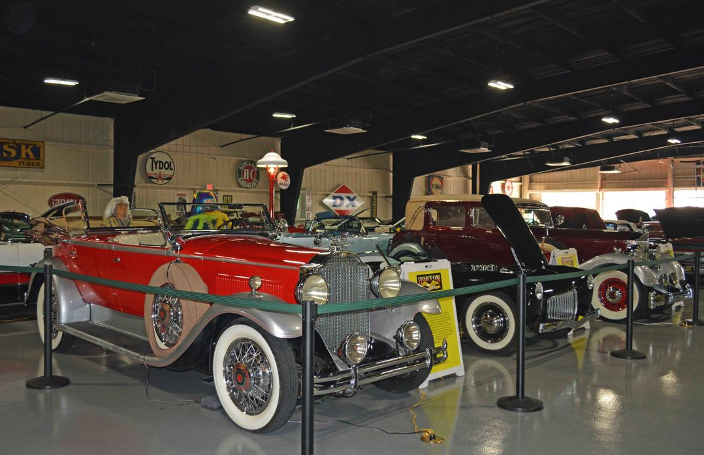 The Museum also has many automobile-related items on display, including a wide array of gas pumps, signs, motors, tools and memorabilia. The cRuise to Eichen's........chicken for the masses! We came, we ordered, and we ate, and we ate, and we ate some more. Then we took home the leftovers. Thanks so much to our cRuise directress Carol and her hubby Jim.....they do a great job for our club. Thanks to the hard work of Carol and Jim Hoffman, club members have been able to enjoy cRuises to Medicine Park and Mount Scott, an adventure to Davis, Oklahoma to a nearly world famous bbq spot and unique combo-motorcycle and sewing machine museum, as well as a trip down Route 66 to the historic Rock Cafe in Stroud. It is not easy to organize and run one of these events. Unexpected things happen, like people get lost, cars break down, potty-stops you scouted 3 weeks ago have suddenly filled up on cRuise day and there is no room to park an additional 18 cars! Carol and Jim Hoffman, Ken Dewbre, David Palmer, Dan and Flo Haggerty, Van Harrington, Bob and Nancy Thompson, Roy Sherry, Gene and Debra Paulus, Terry O'Dea, Billy and Mary Henry, Philip Scott, Chuck Norris, and Duane Brosowske. Below are some photos of our spring cRuise from Norman to Stroud and Oklahoma Route 66.....a fun time with beautiful weather. We lunched at "The Rock" Cafe in Stroud. More photos will be posted when received.